Strange that in one’s memory a house takes on a different shape, a different context, becomes a dream house. When I was living rough, a quarter of a century ago, I spent a couple of months in Granada. Along with some other homeless travellers we squatted a house on a sidestreet off Carerra del Darro, across from the Alhambra. It was a miserable building, known among those of us unfortunate to live there as ‘the house of a thousand turds’, for reasons that do not require too much explanation. But it provided some protection from the rain, and from the cold nights. The point in this digression into my personal past is that I have often wondered about the house – or palace, as it became in my retrospective imagination: I have even wondered whether indeed it actually existed. 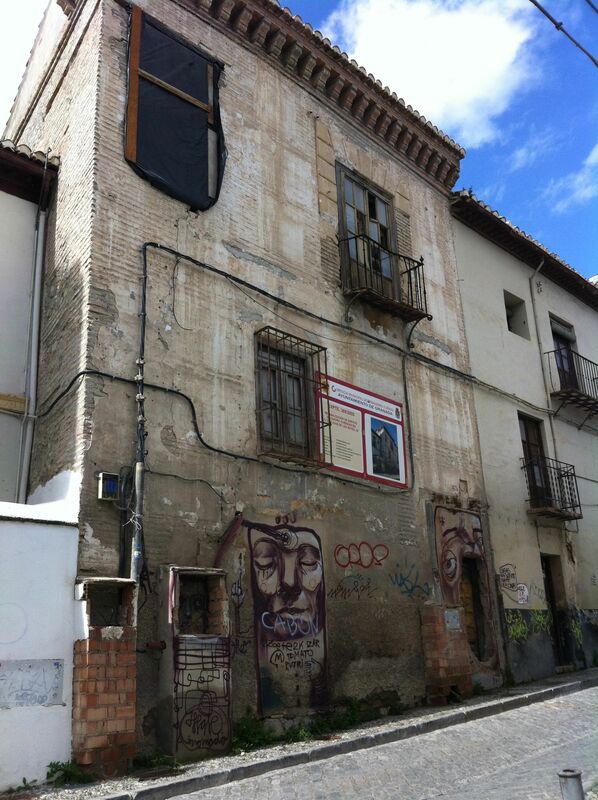 I described its location in the vaguest of terms to Andrés, who has lived in Granada for over twenty years, and he could not think where such a palace might be. 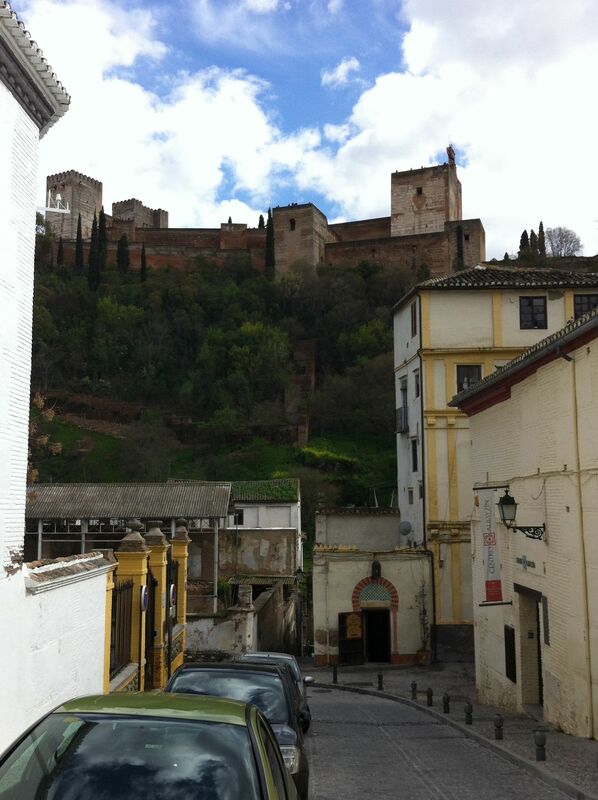 Surely it would be well-known, a palace on a hillside facing the Alhambra? It was bound, he said, to be somewhere on the Albaicín. He even mentioned consulting a local historian, who would be able to identify the mighty house from my description of it. I nodded assent, not really caring: the palace of my imagination would suffice. It was just as well no one investigated my claim. I would have been heartily embarrassed. Last Wednesday, while walking up the hill from the Carrera del Darro (a river – actually a stream – celebrated in Lorca’s Baladilla de los tres ríos de Granada), I came face to face with a boarded-up building that immediately took me back through the years to 1988, and an appalling period of penury, sloth, craziness and some profound melancholy, living from hand to mouth – more often from bottle to mouth – through one Andalucian winter. I knew at once it was the building where I had slept. When I had stayed there, the building was already in a parlous state. It would seem that its role of providing a sleeping place for the homeless continued long after I had left the city. As one of my daughters pointed out however, the plans for restoration are well overdue. The sign apparently says the renovations are due for completion in the year 2008. I stood back from the house and wondered at the capacity of the human brain to convert such a building into a palace. I find no answer. I have dreamed about the house, although it keeps shape-shifting. I have written about it, or versions of it. It is the opening setting for my short story ‘The Handless Maiden’, and provided the inspiration for a prose poem, which I reproduce below. But a palace it is not. It was my first and only visit to the artist’s apartment. He lived on the top floor. His studio offered a sensational view of the Alhambra. But first, he said, we had to negotiate dogshit alley. The artist spoke of it like one describing a secret shame. There was nothing he could do. On the third floor lived a resident who kept a wolfhound. She never exercised the dog, and let him use the landing as a toilet, which he did, prolifically. Formerly, the top flat had been empty, and no one came to visit the woman and her gawking beast. Now the artist was installed above her, and the woman had adopted the stance of long-term resident with rights. The dog, she said, harmed nobody. She seemed oblivious to the smell. The artist could not confront her. Each time he passed the landing he felt like vomiting. He tried speaking with the woman. She would stand in the doorway, the hound slavering and growling at her side. ‘Look’ she said, smiling meekly: ‘he wouldn’t hurt a fly. He’s an old softie’. She ruffled the grey fur on his head, and an incredibly long tongue flicked out and caressed the underside of her wrist. The woman smelled of gin, had white hair, parchment skin, and the smile of a ten year old. ‘He hates going out, see. He gets so scared’. The artist was lost for words. He told me: ‘I don’t know what to say to her’. When we climbed the stairs to the third floor the stench suddenly hit me. I held a handkerchief to my nose. We navigated the landing, stepping over mountainous turds. I didn’t breathe until we reached the attic studio, and walked out into the clean December air. The Alhambra stood magnificent against the backdrop of the Sierra Nevada: an impeccable statement that made me realise that it is the reproduction of a cliched image that renders a cliche, and not the original. ‘You see’, said the artist, ‘I just don’t know how to deal with her at all.’ He lived in the house of a thousand turds with a dying woman and an agoraphobic wolfhound for neighbours. This was the artist’s quandary and he could not resolve it. Finally, on a trip to the coast, we have a modest lunch at Almuñecar, in the Manila bar-restaurant. 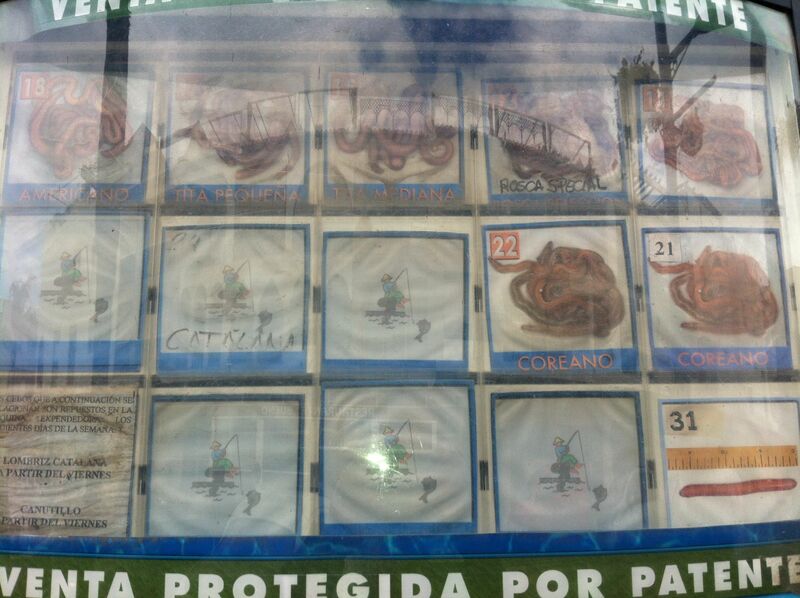 On the way back to the car, we pass a vending machine, selling worms. That’s right: worms. Fisherman apparently puts money in the slot and a bag of live bait comes out. Who the hell thought this one up? These worms, they live inside the machine, possible for months on end. What do they do? What on earth can they do? 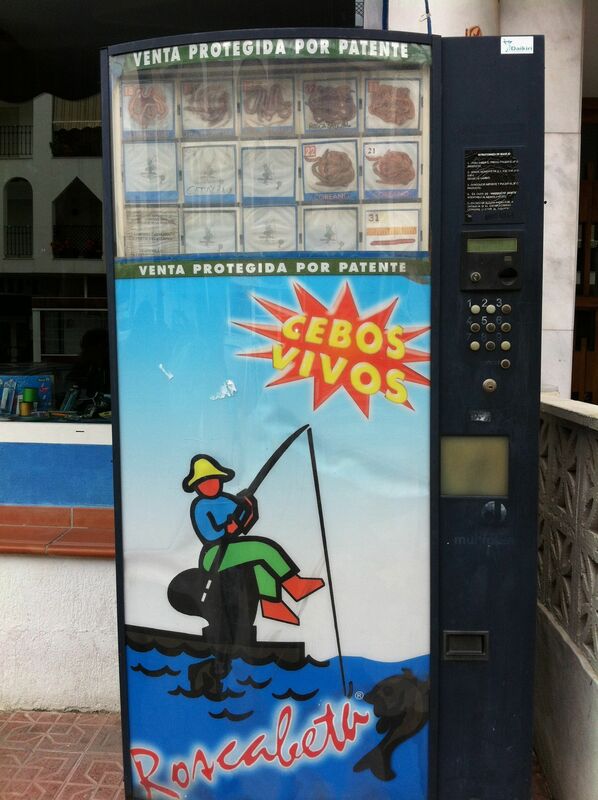 What would you do, packed in plastic inside a vending machine? Have you ever heard of anything so extreme? Who would be a worm?